- On 9/11, with only minutes left before World Trade Tower One collapsed, window washer Jan Demczur was trapped in an express elevator with five other passengers and he used his squeegee to pry open the doors and to chisel through five layers of dry-wall, allowing them all to escape. Jan Demczur's quick thinking and perseverance saved not only his own life on September 11, but the lives of several men he didn't even know. Mr. Demczur came to the U.S. from Poland in 1980, and since 1991 had worked as a window cleaner at the World Trade Center. He remembers riding the elevator past the 44th floor of the north tower the morning of September 11, when something suddenly went wrong. "Elevator went up, and couple seconds later, not even a minute, elevator started going down, dropped several floors,"
Mr. Demczur now says. "We looked at each other like something wrong." (In fact, American Airlines Flight 11 had just hit their building.) Mr. Demczur says they tried the emergency stop button, tried the intercom, but nothing worked. The elevator shook hard from side to side, a voice came on the intercom saying there had been a problem on the 91st floor, and then things got decidedly worse. "I saw the smoke coming up from bottom [of the elevator]," Jan Demczur says. "Your heart start beating faster. We didn't know if anyone was coming to help. Intercom started breaking up. He didn't hear us. No more voice. We just looked at each other, and what you going to do, the smoke coming, we have to do something." One man pounded on the roof. Nothing. Two of them then pried the elevator door open and started kicking the wall. But it was no use. More smoke was now seeping in, and the air was getting hot. The men knew they had to break through the wall, but no one had a knife or any other tool. That's when Mr. Demczur thought of his squeegee. He took off the handle and started scratching the wall. "He kept working at it with this squeegee," said Alfred Smith, one of the occupants of the elevator. "It was like he was meant to do that… like he had a willpower that we are going to get out of here." The four men took turns and finally dug deep enough that they were able to kick through the wall to a 50th floor bathroom. The men then fled the building, only five minutes before it came crashing to the ground. Mr. Demczur had only just sat down on a curb to register what had happened when the second tower began to fall. "I looked back and I see antennas going down, and tower start falling," he says. "In this point, I scared. I say I'm gonna die here now, the tower is so tall and I too close. I don't know which way tower gonna fall, but when I saw antenna was being right my direction, I said God I'm dying here. I start faster, I run faster, I run maybe like three blocks. And I keep always eyes behind my shoulder which way the building going. And I see it not going nowhere, just sliding down floor by floor, I just heard the bang bang bang." "At this point, I was shaking. So pain. I was just pray to God, thank you God, you help me get out, you keep the building longer, get me out from building. But lot of people doesn't make it, and I was worried about people. When I know that lot of people escape but not everybody, I said wow, boy, what's going on here, who did this, for what reason, why they attack the World Trade Center with the civilians working?" - Shoelaces with magnets in the tips and a wire saw sewn in the fabric. MI9's Clayton Hutton was an ingenious designer. His secreted maps, compasses and other devices assisted British RAF (Royal Air Force) personnel to escape the enemy. A, B and C. Amazingly, the prisoners were able to construct, hidden behind a fake wall in a chapel attic, a 2-man working glider with a 33-foot wingspan using cloth from sleeping bags, floorboards and other materials from their cells! The book Sneaky Uses For Everyday Things shows how to make plastic from milk. Now see how people make boats out of milk cartons! Under cover of a temporary civil servant for the Ministry of Supply's Clothing and Textile department (Dept. CT6), he supplied equipment and gadgets for secret agents, saboteurs and prisoners-of-war during World War 2. He was the man immortalised by Ian Fleming as 'Q'. Before the war he had been working as a Christian missionary in Morocco, where he became adept at procuring supplies from just about any source. It was at a lecture about his exploits that he was spotted by the Director of the Ministry of Supply in Leeds, and was invited to work for them on a secret project. His first order was to produce 100 Spanish Army uniforms, in case the Special Operations Executive (SOE) needed to infiltrate agents into Spain to prevent the neutral Spain entering the war on the side of Germany. He sent out a sample of the cloth to a leading textile firm, specifying that the fabric be "thick, coarse, cheap and nasty". Unfortunately the manufacturer decided to be patriotic and sent back a sample roll of a much finer cloth, with a note saying that he shouldn't be bothered about the extra expense as it would be absorbed "on Britain's behalf". 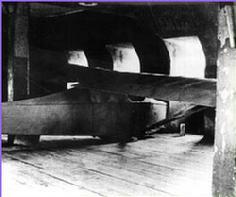 The roll was returned by Fraser-Smith with a note stressing the need to specify the material as specified, but it still took three attempts before a suitable fabric arrived. Some items were fairly standard items - miniature cameras, small automatic pistols, continental-style luggage, etc. and could be picked up from second-hand shops, dealers, foreign nationals entering the country and even lost property offices - the owners were simply offered a brand new replacement and were normally quite happy to accept. Other items were special designs and gadgets that Ian Fleming's 'Q' would have been proud of. He estimates that 50% of the orders he received were exact specifications (like an order for 300 small automatics required in 3 weeks), 40% were approximate specifications (like the pens with hidden compasses) and 10% were his own idea. Tiny Minox cameras. He arranged for a leading London photographic dealer to supply quantities of the very useful miniature cameras which were then secreted in cigarette lighters and used by secret agents and saboteurs. Working torches with one genuine battery and a dummy 'battery' containing a secret compartment. Shaving brushes where the top (the bristles) unscrewed. To prevent discovery the top was threaded the opposite way so any attempt to 'unscrew' the top would in fact tighten it. Pens containing a compass, a secret compartment for a paper-thin map and a magnetised clip which could be balanced on a pin to provide an emergency compass. Tunic buttons containing a compass or (rarely) and explosive charge. Cap badges and shoe/boot laces containing Gigli saws. The Gigli saw is a thin, flexible band saw used by surgeons during brain surgery. Hairbrushes containing a secret compartment containing larger maps and a 9cm double-edged saw. The hairbrush went through many variations. A used match containing a magnetised needle that could be casually dropped in a puddle to form a compass. Maps printed in invisible ink on ordinary handkerchiefs. For safety, the handkerchief needed to be soaked in urine to develop it - something everyone has a ready supply of. A smoker's pipe containing hidden compartments and an asbestos lining to protect the contents. Chessmen, draughts and playing cards were provided for POWs, containing secret compartments. Packets of "12 Razor Blades" that in fact contained a complete razor, soap and 3 magnetized blades. These could be carried by a bearded or moustached agent for altering their appearance. 'Indestructible' paper that allow an agent to take notes in damp conditions. 'Flash' paper impregnated with a magnesium compound to burn instantly leaving almost no ash. Edible notepaper based on rice paper. Cigarette holder telescope (complete with nicotine stains). Fake money. The notes with printed in the basement of the Science Museum in South Kensington. Itching powder for a French company manufacturing vests for U-boat crew. Incredibly simple sabotage! He was asked to provide a container 6' 2" long, 3' wide, to carry a 'deadweight' of 200lb. Fraser-Smith, as usual, didn't ask why, but later learned that the container was used in Project Martin. Project Martin was immortalised in the film "The Man Who Never Was", starring Clifton Webb. The body of a man who died of pneumonia was provided with papers and personal effects of a 'Major Martin' of the General Staff, and the body and a briefcase containing the plans for an allied invasion of Sardinia was dumped in the sea off Spain. Copies of the plans duly fell into the hands of the Germans and they prepared for an attack - but the real attack, when it came, was targeted at Sicily! 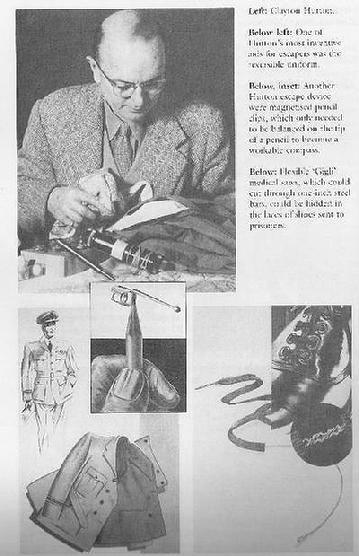 He was asked to make copies of a new type of Luftwaffe life jacket and made a couple of interesting discoveries that were subsequently incorporated as standard in RAF 'Mae Wests'. The first was a small metal cylinder that turned out to be compressed air for inflating the jacket. Up until then many airmen were lost simply because they didn't have the strength to blow up their life jacket. The second discovery was a pouch filled with a mystery powder, who's purpose was only discovered when Fraser-Smith washed his hands. The powder was a powerful fluorescent dye. Fraser-Smith was critical of the golf balls used in the Bond film "Diamonds Are Forever". The balls, used in the film to hide diamonds, would not have been acceptable to him unless they behaved as a normal. The golf balls he supplied, containing a compass or a supply of forger's ink, could be played like a normal golf ball and you would never suspect otherwise. Do you know of an interesting story of clever resourcefulness?